It is thought that the Australian Shepherd was developed by Basque sheep herders who came from Australia. American livestock producers have continued the development of the breed maintaining it's intelligence, versatility and herding instinct. They love to work and are willing to try their hand at almost anything its owner wants them to do. Aussies are one family or one person dogs by nature. They do not accept strangers as their natural friends. They are excellent protectors of home and property. 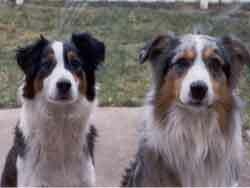 Acceptable colors of Australian Shepherds are red, black, blue merle and red merle. White and tan markings may appear on the face, chest, front and rear legs. The coat is moderate length and weather resistant with a soft, dense undercoat. Eyes come in a variety of colors from blue, to amber, to hazel, to all shades of brown. Tails are docked. Alert, quick to learn and easily trained, Aussies are very active dogs and need a great deal of exercise to keep them from become bored or frustrated and developing bad habits. The United States Australian Shepherd Association was established as the parent club of the Australian Shepherd representing the breed to the American Kennel Club. On September 1, 1991, the AKC recognized the Australian Shepherd breed and on January 1, 1993, accepted them into the Herding Group. A medium-sized dog, the males weigh 50 to 65 pounds and are 20-23 inches at the withers. The slightly smaller females weigh 40 to 55 pounds and stand 18-21 inches.